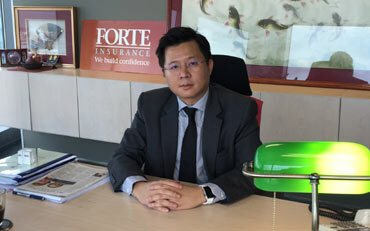 Global Banking & Finance Review interview Charles Cheo, CEO of Forte Insurance to discuss the insurance sector in Cambodia and Forte Insurances award-winning success. Congratulations on successfully on being awarded “The Best Non-Life Insurance Cambodia 2016”, “Most Innovative Insurance Product Cambodia 2016” for EmCare and “Best Insurance Company Customer Service Cambodia 2016”. How does the award-winning success fulfill and validate the role Forte plays in Cambodia’s growing insurance market? These awards and the other accolades we’ve received prove we’re on the right path. They vindicate our 18-year-old vision of establishing a company with international standards and building a team of professionals that provide the best services and insurance solutions for Cambodia. According to the most recent statistics from the Insurance Association of Cambodia for General Insurance performance in 2015, Forte Insurance dominated the market once again increasing the gross written premium from $23, 868,605 to $27, 894,139 and saw your market share increase to 45.3%. What do you attribute to this success and how what are your plans for continued growth? The fact that more Cambodians are realizing the importance of insurance. But our success is also due to our employees. 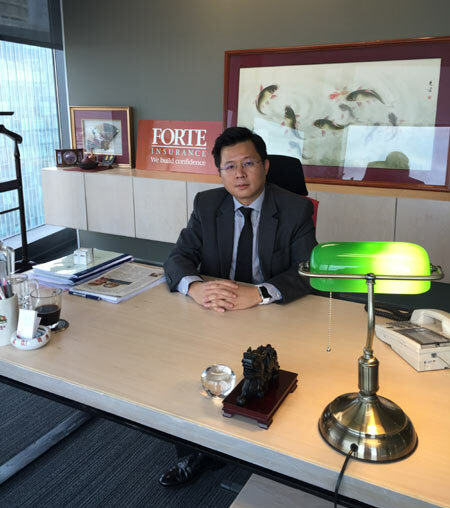 Forte’s committed, hardworking and experienced team is the reason why we dominate the market and are recognized by international organizations. We frequently inform our employees that even the little things they do at work daily means something, and when added together, their collective work contributes to Forte’s success story. But despite having a team providing the highest levels of quality service, we’re not resting on our laurels. This is a fast-moving market and to keep up with it, we will continue to invest in people and technology to deliver insurance products. We continuously research the needs of the local market and suitability of products to offer services that make a difference in terms of value, innovation, and overall customer experience. How would you describe the international standards Forte brings to Cambodia? to our staff to equip them with superior skills, knowledge, and professional ethics. Our people are our main asset, and their constant professional development is critical to our continued success. In fact, Forte has the highest number of staff (18 people) with AMII and ACII designations in Cambodia. Through our international network, we frequently invite overseas experts to deliver training sessions.Our management team is also encouraged to participate in regional insurance conferences. By bringing these internationally recognized standards and practices to Cambodia, we are leading the way towards providing exceptional, world-class services and products. What are some of the current trends you see facing the insurance industry in Cambodia? More consumer product lines, which have been growing during the past few years. But at the same time, a large part of the market is still not insured, and there’s potential for growth. We still have lots to do to capture that market, mainly by making everyone realize how insurance can enrich their lives and provide them peace of mind. Customer service is a priority for Forte Insurance. Why is this a focus for you and how do you continue to meet the ever-changing needs of customers? We focus on providing values rather than products, thus,Forte’s primary objective has always been to draw confidence and trust from our customers. Our clients expect professionalism, efficiency, and reliability from our service. Our goal is not only to meet these expectations but also to exceed them and provide assurance, trust, and unmatched value for money. This is why we have always placed a high priority on pinpointing the precise insurance needs of our customers. Our staff continually creates unique customer knowledge and insight, which allows us to adapt and even anticipate potential demands for new products and services. By working closely with our clients and constantly introducing new lines, we offer them value-added products to suit their needs as they evolve. Knowing and keeping track of local insights is another way. Forte has always focused on what is appropriate for Cambodia. For example, we maintain a policy of short tail liability, whereby we settle customers’ claims within a limited time from the date of the claim. This is because we understand that the Cambodian environment is not currently conducive to long-term liability. This viewpoint, in fact, stretches to all segments of our business strategy. We continuously research market needs and product suitability for Cambodians. Forte also has a department of homegrown professionals that deal with existing and new product development. Our products are solely Forte-branded and developed especially for Cambodians. Can you tell our readers more about EmCare? EmCare is a corporate Employee Benefits package for companies with more than 10 staff. It is the only one of its kind in the market at the moment. EmCare is a customizable, flexible healthcare that provides a comprehensive set of benefits with protection from both accidents and illness. The package includes hospitalization, surgery, inpatient and outpatient treatment alongside optional maternity, dental care, permanent disability and death benefits. It offers the flexibility to tailor-made insurance package to suit a company’s needs and budget as well. At the moment, EmCare is trusted by a diverse range of our clients like Coca-Cola, GlaxoSmithKline, Bayon Airlines, RMA Cambodia, Rosewood Hotel and Brown Coffee and Bakery, among others. What other innovative products and solutions have you developed recently? We continuously introduce new products and solutions, and there are some in the pipeline right now. Our latest product, however, is a weather insurance index for farmers. This line minimizes the risk from floods and droughts and also ensures farmers do not get into debt. We’ve already launched our pilot project in selected districts and provinces,and the response has been positive thus far. It’s heartening to know that more Cambodians are looking towards insuring themselves, whether to safeguard their health or when obligated to do so under loans to purchase houses, cars and so forth. We advise those yet to insure themselves to know their insurance company, products, and services first before making any purchases. Most customers look at costs before making a decision. With insurance, however, after-service is the most important thing.